I’m back! Bright eyed and bushy tailed and ready to take the world on. Thank you all sooooo much for your thoughts and comments on my last post. I really do appreciate each and every one of you no matter if you comment daily, read silently, but religiously or just pop in every now and then. Or heck, if you’re reading for the first time today. Before I go any further, I thought I’d jump over my no-talking-about-my-son line in the sand. Ooomph – I needed a running jump to get over that one. So, I think we have a new game plan for my son right now. He’s had issues with his lungs in the past due to his prematurity. It’s one of those things that a lot of preemies go through just because your lungs are not ready to do real work yet when you’re coming out two months early. The lungs get damaged and need time to recover. But when he developed a cough that would not go away this fall and it just lingered and lingered, I knew something wasn’t normal. It wasn’t anything big enough to warrant a trip to the ER and numerous trips to the Pediatrician just made me feel like a hypochondriac. I don’t know how many time I was told it was “just a cold”. Months passed, coughing continued and when his normal yearly check-up with his Pulmonologist occurred recently, I finally felt vindicated. And more than a little guilty that I had let the local doctors dismiss the problem so easily. Don’t mess with a Mom’s intuition. Turns out that having a cough for six months is not normal. It’s not just a cold. The Pulmonologist WAS concerned about it. So after a few tests and trying a few different inhalers, we think we’ve got the right combination of meds that can control his cough and keep his 02 levels where they need to be. We still don’t have an answer for why exactly the cough was occurring yet, but it’s gotten a whole lot better and I’ll take that for now. It’s a new daily routine, but we’re getting used to it. God, get me started and I just don’t shut up! So what’s been happening around here on my little stay at home spring break? For one, my daffs have popped up. Sort of. They’re just shoots right now and I may have to put blankets on them tonight since it’s going down below freezing. Again. But it’s hope, right? And no, I haven’t raked all the leaves up from last fall yet. I did lots of dog walking. Dogs loved it. My feet, not so much. I need a great pair of walking shoes, so if you have any recommendations, bring them on. I did a lot of cleaning and organizing. It feels nice to have the dust bunnies under control. And all my underwear clean at one time. I did a little bit of retail therapy. Some thrift stores. A few estate sales. And even Target. Did you see those lids on the Ball jars in the first photo. Found the lids in the dollar bins at Target. Oh, yeah! 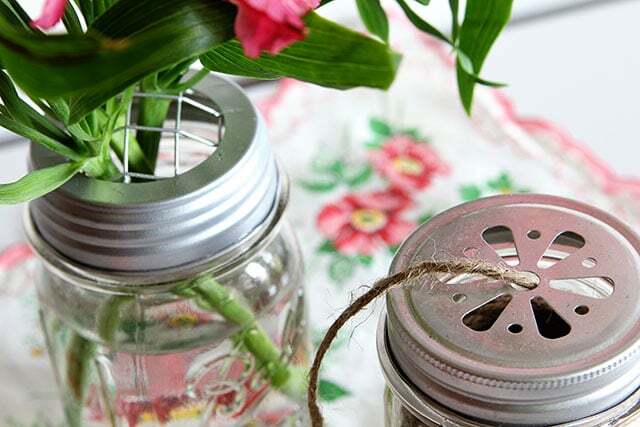 The one on the left is a flower frog type thing and the one on the right is a thing to make a jar into a drinking glass (just insert straw into middle circle). Or in my case, I use it to hold my ball o’ twine. That about sums it up. Glad to be back. I’m raring to do some spring projects and can not wait for garage sale season to kick into high gear here!!! So nice to see you back, Pam, I’ve missed you! I’m glad you are getting some treatment for your son…a parent’s intuition is usually right! Lovely photos…I’ll have to look for some of those lids! Thanks, it’s good to be back. I was getting a little stir crazy with too much time on my hands. Mother’s intuition is usually right on. I’m glad you’ve got a treatment plan. I’ve been thinking about you and your son. We still haven’t been able to see our grass yet and I I can’t wait to see what mess lays under our snow mounds. It’s going to be a HUGE mud pit in our backyard. Josie will be heaven. I grabbed some of those lids in the Target $1 bin too. Awesome find! Welcome back. You have me addicted to that Target dollar section now! I used to overlook it and now I scour it for fun stuff! happy that you finally got a plan for your son….it takes a lot these days to get people to listen!!! and today I spotted either tulips or daffodils popping up in our back….WOOHOO…they look like tulips…but we planted a big mix of each…so time will tell..and for this former Phoenix girl..this is exciting stuff….lol and I NEED some of those tops for canning jars…I MUST get to Target!!!! I bet they’re daffodils. My daffodils always poke their heads up right before the tulips do. 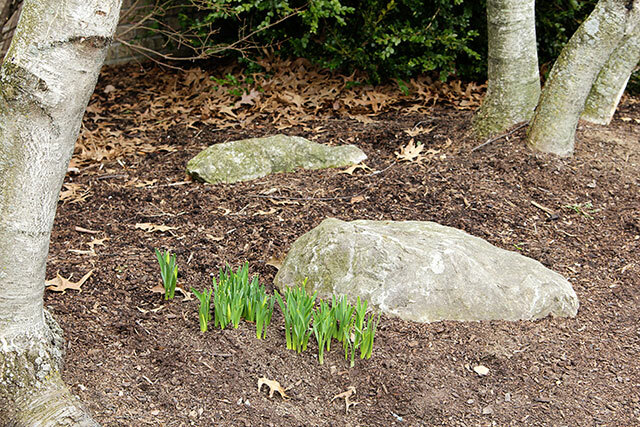 Either way it will be nice to see some color in the flower beds again! So good that you found someone to listen… I love those lids and have to get to Target! I’m so sorry to read that your son hasn’t been well, Pam. I’m glad you’ve got things sorted out and that things are looking better for him. Every time I go to Target, I look for those lids in the Dollar bins. My Target is a little slow. We just now got the cute straws that everybody has been showing off on Instagram for weeks. Hopefully those lids show up soon. I need them! Well, not really but Target has a really good way of making me think I do. So good to hear your kiddo is sorted out for the time being. It’s just a long haul, isn’t it. 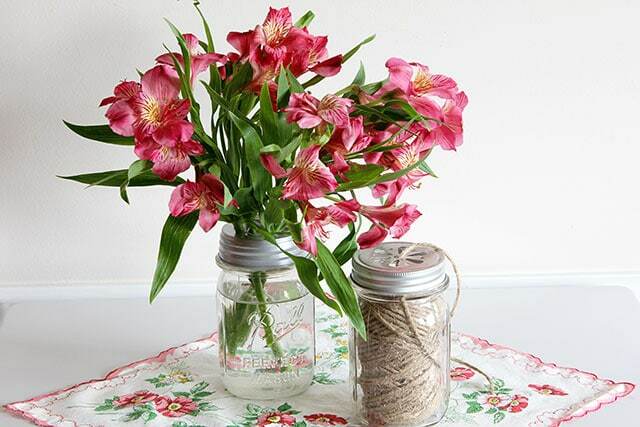 But, the flowers in the jar are wonderful. Glad to hear your son has a new course of treatment for his lung problem. My daughter was born with hyline membrane disease and my husband has COPD, so I know how stressful such things are. LOVE the ball jar lids. Very nice, indeed. I’m glad you’re back, really glad that your son is now getting proper treatment–shame on the pediatricians! My grandson was dismissed as “just a cold” last Oct, and later when he was rushed to the ER, found to have double pneumonia! Thank you for sharing about your son Pam. And I’m so relieved to hear you’ve figured out that cough. It’s scary when those things persist. But Moms know when something’s not right. Sending warm, positive prayers that he gets nice and healthy real soon. Glad all is well! Okay… I have GOT to stop at Target and look for those jar lids! I want ot use one for string just like you did – what a great idea!!! And vintagey (is this a real word?) looking too! Hope the daffs bloom pretty!!! Nice to hear from you! You have a good message in your post…don’t ignore something for more than a few months before you start trying to get answers. I waited to long to find out why I was so tired, if my condition had been caught sooner I would be stronger now…not full strength, never that again. Wish we had a Target here…loving those lids. HAPPY SPRING!!! So glad that he is feeling better. Sometimes the doctors need to listen to the moms. We didn’t go anywhere here either. Since I am on a school schedule, delivering and picking up, I feel like I had a Spring Break. So many years going places feels like I should have been somewhere, hah. Sounds like you got a little shopping in. Have a good week. I wished that Dr’s realized they were human too. not back down. Way to go. Glad he is doing better!